Telescopic boom lifts are a type of versatile heavy-duty industrial equipment which has been used in a number of ways since their original inception over 50 years ago. These lifts have revolutionized the way many common industrial tasks are completed today, with new innovations occurring all the time as new potential uses are discovered and explored. 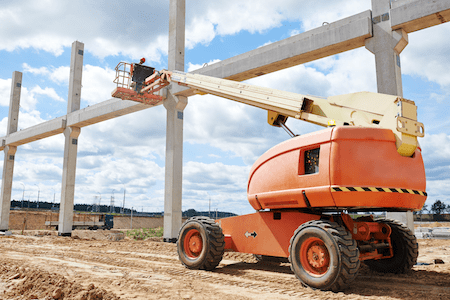 There is quite a bit to know about telescoping boom lifts, including where and when to use them, how to properly operate them, and how to avoid potential safety hazards while an aerial lift is in use. You may also be interested in obtaining specific information related to special telescopic boom lift training and where to rent the right piece of equipment to meet your specific needs. Telescopic Boom Lifts have superior horizontal outreach. The telescopic boom lift is believed to have been invented by Canadian inventor Walter E. Thornton-Trump in the 1950s. Thornton-Trump originally referred to his invention as the Giraffe, but these devices would later commonly be referred to as Cherry Pickers because of their extensive use in orchards when they were originally created. Walter E. Thornton-Trump patented his invention in the early 1960s when he used terms like “power-operated boom structure” and “lifting apparatus for electric-line and construction workers” to describe the machines in an official capacity. Early models were almost always attached to a truck or similar transportation medium. Today, telescopic boom lifts can also commonly be found as stand-alone devices, with their own base and transportation structures. While the telescopic boom lift started with humble beginnings, it has quickly become a diverse and widely utilized piece of equipment, with new innovations occurring on a constant basis as new challenges arise. New iterations of the telescopic boom lift tend to emerge whenever a new obstacle presents itself, making this one of the most versatile and capable pieces of industrial equipment in the world. The first recorded patent related to Thornton-Trump's telescopic boom lift dates back to 1952 when he patented what he referred to as a “machine with elevatable and traveling carriage.” Design sketches show early iterations of what would become modern telescopic boom lifts, with a carriage attached to a telescopic arm protruding from a small mobile platform that can be hitched to a truck for transportation. This earliest design was not very versatile, but certainly met the needs it was designed for at the time. A more specialized version of the telescopic boom lift was patented in 1972. This refinement was simply referred to as the “telescopic boom” and is one of the first iterations that shows the lift attached to an independent mobile apparatus. This progression is believed to be a major contributor to the lifts commonly found in modern construction, fire, and rescue vehicles. In 1980, Russell L. Sterner filed a patent for a device known as the “crane boom extending, retracting, and cooperative latching arrangement.” This refinement is largely credited with reducing the overall weight of the boom, while simultaneously increasing total weight capacity. By making the boom lighter and increasing its load capacity, Sterner was able to effectively secure a place in the manufacturing and warehouse industries as a common piece of equipment. John T. Hornigald filed the patent for what is officially known as the “telescopic boom elevating apparatus with a mechanical lift and level linkage system” in 1991. 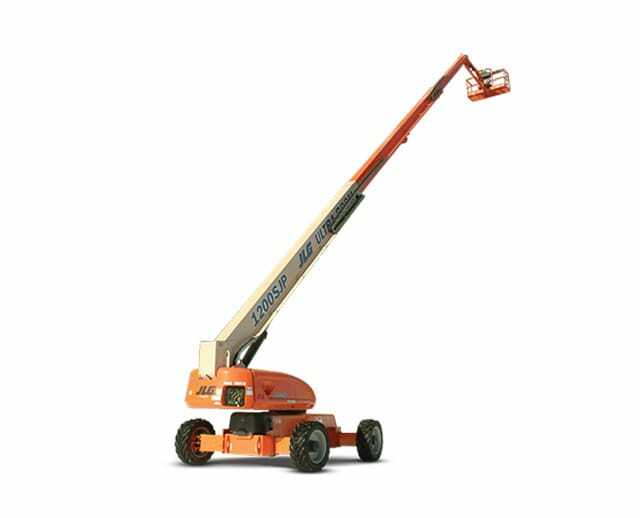 In simple terms, this is a telescopic boom lift attached to a small mobile apparatus that is designed for one person to operate in relatively close quarters. 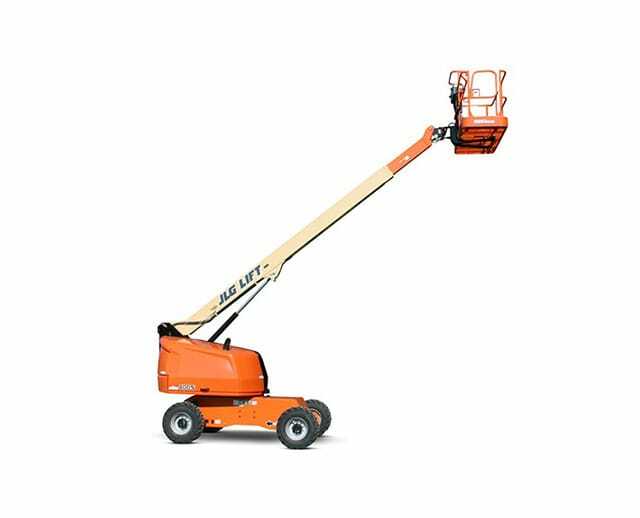 Telescopic boom lifts of this nature are commonly found in maintenance applications, particularly when a worker needs to safely reach high places and have a reasonable amount of room to work. 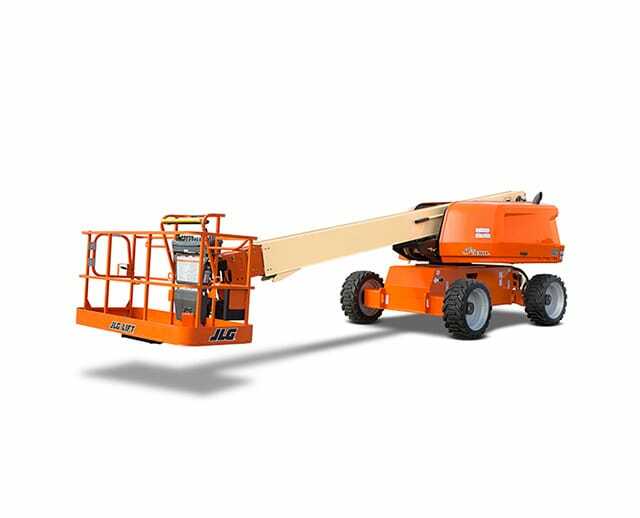 JLG Lift Equipment is an international manufacturing company that was founded in 1969 by John L. Grove. 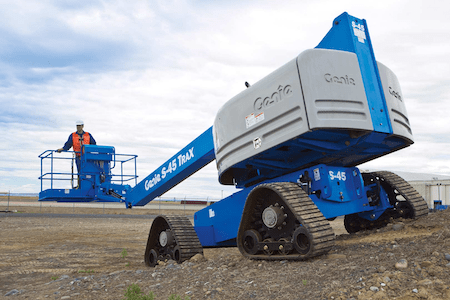 JLG has been delivering heavy-duty equipment such as telescoping and articulating boom lifts, scissor lifts, and forklifts for nearly half a century and is widely recognized as a trusted brand that consistently delivers superior products, training, and support. In 2005, this recognition earned the company a global partnership with Caterpillar and it has been leading the charge in equipment innovations for many years. Created in 1966 when the company's founder, Bud Bushnell, obtained the manufacturing rights for compressed-air powered lifts, Genie Industries has been manufacturing heavy-duty and construction equipment for over 50 years. The company originally got its name when customers referred to the compressed air that powered its machines as “magic in the bottle.” In 2000, Genie partnered with Terex. Because Genie machines were so well known in the industry, the brand maintained its name as a subsidiary of its parent company and continues to produce equipment that meets and exceeds industry standards. Manitex specializes in producing high-capacity equipment in specialized industries such as general construction, industrial plants, steel erection, and telecommunications. Manitex places a high priority on safety, quality equipment, and customer satisfaction. They strive to provide their customers with the very best equipment, training, and safety materials in the industry. NiftyLift is one of the world's largest heavy lift equipment manufacturers, specializing in equipment such as boom lifts, cherry pickers, and access platforms. This company utilizes innovative design methods to create some of the most versatile and reliable lifting equipment on the market. NiftyLift also makes use of a thorough testing process to make sure every piece of aerial work platform that rolls off their assembly lines meets specific quality and safety standards. This is by no means an exhaustive list of telescopic boom lift manufacturers. The ones listed here, however, are among the most popular manufacturers in the industry. 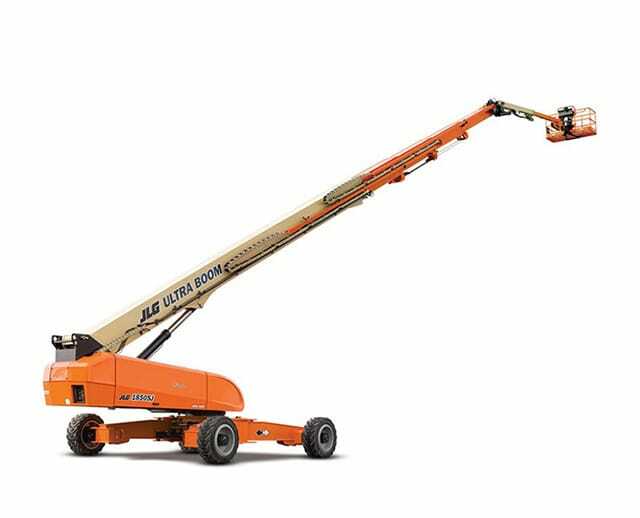 The JLG 400S has a maximum weight capacity of 600 pounds, with a platform height reaching 40 feet. Popular applications for this model include construction, exterior building maintenance, and large vegetation trimming. JLG's 460JS is also widely used in these settings with a similar weight capacity and 46 ft platform height. 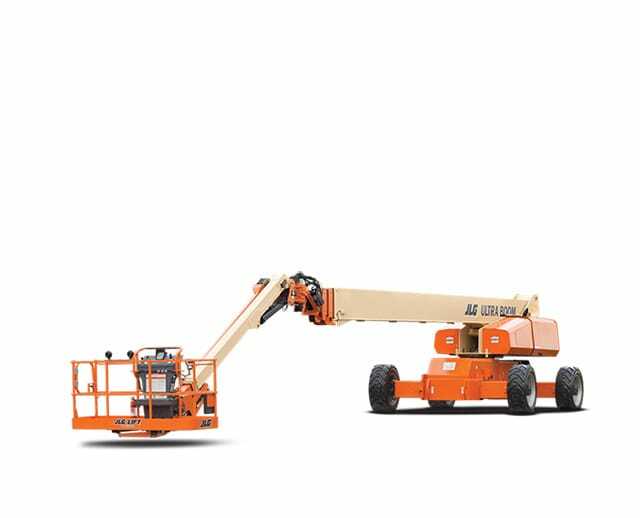 Reaching an impressive 59 ft platform height, with the same 600 lbs weight capacity, the JLG 600S is ideal for construction and repairs on larger buildings. The S-40 and S-45 are best used in limited access spots and will most commonly be found in construction and industrial settings. Each platform has a 500 lbs weight capacity and a 40 ft platform height. The S60X is better suited for heavier tasks, with a weight capacity of up to 1,000 pounds, restricted, and a 58 ft platform height. The Manitex Octopus is best suited for working in tight spaces, thanks to its compact frame, 70 ft maximum work height, and 440 lbs weight capacity. The A62 is optimum for heavier outdoor work. This model is hard-mounted to the bed of an industrial truck and the boom arm is affixed to a rotating turret for greater control and flexibility. Each of these models is trailer mounted, making them best for outdoor use in a stationary position. The 120 and 120T have the same weight capacity and platform height, at 440 lbs. and 40 feet, respectively. 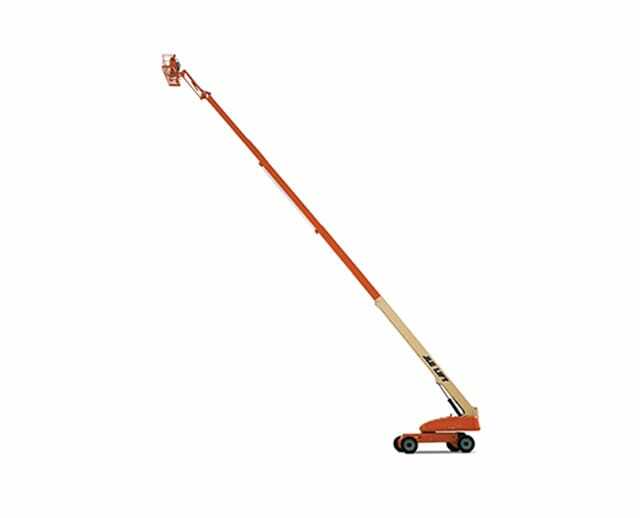 The 150T accommodates a slightly higher load with a 500 lbs weight capacity and 48 ft aerial platform height. JLG's 400S telescopic boom lift is ideally suited for working in relatively tight spaces, thanks to its compact design. An impressive weight capacity for a lift of this size allows the platform to bear loads of up to 600 pounds, while the platform raises to a maximum of 40 feet. These attributes make the 400S popular in multiple usage scenarios, particularly in outdoor construction, building maintenance, and topiary work. The 400S is also known for being extremely durable, owing to its unique DuraTough hood. This Deutz diesel engine telescopic boom lift adds versatility to the mix with a rotating base, allowing workers to reach more without having to reposition the lift chassis. The safety and versatility features built into the S-40 and S-45 lifts make them the ideal choice for most outdoor construction and industrial applications. While most lifts focus primarily on platform height, the Nifty 150T carves out a unique niche by providing maximum outreach without sacrificing height. 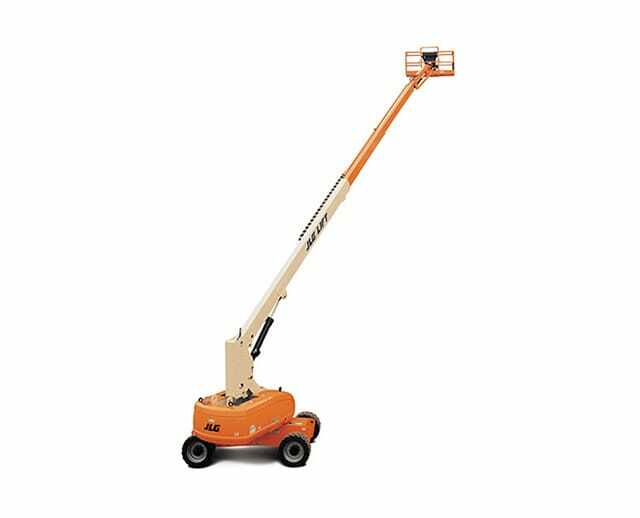 This makes the 150T ideal for a number of situations, such as working on or around buildings with steeply slanted roofs where other telescopic boom lifts may not be able to reach. The Nifty 150T can safely accommodate a platform weight of 500 pounds, with a height of 48 feet and a 25 ft outreach. This lift sits on a stationary platform and, once in place, it is not easy to reposition. However, this inconvenience is somewhat offset by the lift's rotating chassis, which provides a pretty impressive working envelope. Straight Boom Lifts are able to perform successfully in various heavy-duty applications. Certain mobile platform and track-mounted boom lifts are also well suited for this type of work. Certain special cases might require the use of more specialized equipment. JLG, for example, specially manufactures crawler-mounted units that have been used in situations in which other base types were ineffective. In one particular situation involving an underground project at the Logan Airport in Boston, conventional four-wheel-based lifts were unable to effectively traverse the muddy terrain they were faced with. The solution was to bring in specialized crawler-based units that were more easily able to handle these unique conditions. While most scenarios will have a fairly standard solution, it may be necessary to seek out specific equipment to meet unique needs. If this is the case, be sure to speak with a professional regarding your exact requirements and the equipment you'll need to overcome these challenges. Equipment rental companies, such as BigRentz, specialize in helping customers identify their needs and find specialized solutions to meet the unique demands of the job. Electric shock or exposure to live currents. Falling from the lift, even at low elevation. The lift tipping over, due to unsecured, loose, or broken safety lines. Tools or other objects falling from the lift, potentially striking other workers. With these potential hazards in mind, it is possible to put preventative measures in place and minimize the risk of possible injuries occurring during equipment operation. With a safety-first mindset and proper safety protocols, the safe operation of a telescopic boom lift is well within the realm of possibility. Most accidents only occur because safety was not taken seriously or important steps and procedures were overlooked before or during operation. In many cases, the best way to avoid an accident or injury is to raise employees' awareness of the hazards associated with their job and properly equip and empower them to minimize potential risks. While the employer is ultimately responsible for a worker's safety, that worker must also assume some responsibility by being aware of their circumstances and taking necessary and appropriate actions to protect themselves against potential work-related hazards. Avoiding falls can be accomplished by remaining alert and wearing fall-prevention devices such as a harness, while avoiding tip-overs is most commonly addressed by properly assessing the work environment and selecting the right equipment for the job. Finally, avoiding injury related to objects falling from the lift is as easy as making sure bystanders and other workers are kept away from the area immediately surrounding the lift while work is in process. Expecting an equipment operator to work safely is pointless unless that individual has received proper training on the specific piece of equipment they'll be using. Proper training is essential, not only for safe operation but for efficient use of time and resources as well. Even if you're only planning to rent a telescoping boom lift for a single day, the person who will be operating the equipment will greatly benefit from taking the required training. In fact, many companies will not allow you to rent their equipment until the required training for that specific piece has been completed. Operators are also able to add relevant training to their resumes, which can be a powerful motivator for employees to participate in these training courses. If you're planning to rent equipment from a local provider, be sure to inquire about training programs related to the equipment you're planning to use. Choosing to skip this important step can have detrimental effects and many equipment rental companies will not allow you to use their equipment until training has been completed. 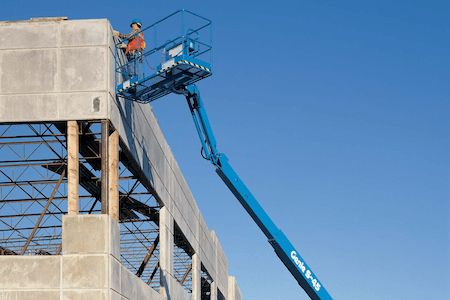 Question: Where can I find a telescopic boom lift rental? Answer: There are a number of local rental companies, such as BigRentz, that offer rental services for telescopic boom lifts. Question: For how long can I rent a telescopic boom lift? Answer: BigRentz offers rentals for any time period, from a single day to a month at a time. 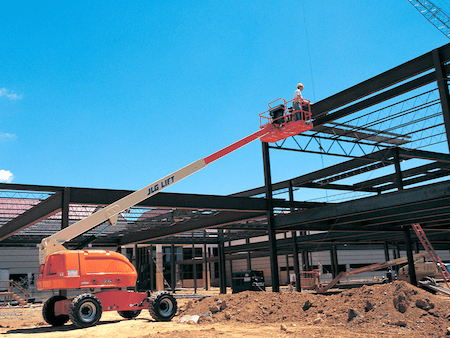 Question: Is training required to use a telescopic boom lift? Answer: Safety should be your number one priority when operating a telescopic boom lift and most companies will require this to be completed before entering into a rental agreement. Question: How do I choose the right telescopic boom lift to fit my needs? Answer: Consider your specific needs carefully while keeping your operational budget in mind. If you need help selecting the right equipment, a sales and rental professional can help steer you in the right direction. Telescopic boom lifts are quite versatile in their potential use applications and can be utilized in a wide variety of scenarios. These aerial work platforms have been utilized in industrial settings for over half a century and have revolutionized the way many common tasks are completed while making previously difficult or impossible jobs much simpler and easier to complete. 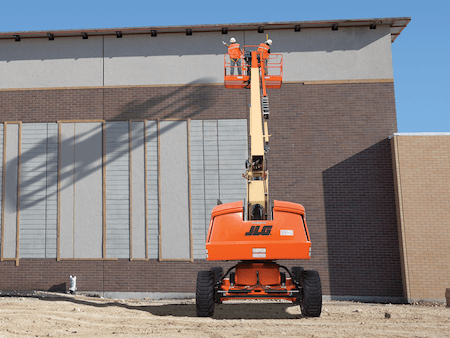 Proper training is essential to safely operating a telescopic boom lift, so be sure not to overlook this important step in proper equipment operation. By participating in this required training, you'll be able to minimize worker exposure to hazards such as electrocution, falling, and being struck by falling objects. For more information on a telescopic boom lift rental, purchasing important training courses, and more, contact a professional at BigRentz and set up a time that works for you to discuss your specific needs. You can stop by a local BigRentz site or call (888) 325-5172 to speak with a professional over the phone. BigRentz has hundreds of locations across the United States, each with certified professionals who are dedicated to providing you with the best possible equipment and customer service available.